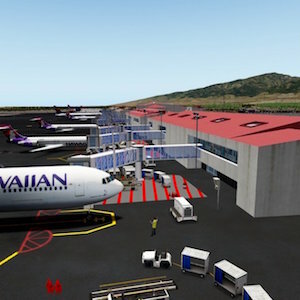 In real, Kahului Airport is the primary airport on the island of Maui and receives both overseas and inter-island flights. This NAPS HD fully customized scenery (SketchUp), animations, including some of Marc Leydecker’s & Hans Gindra’s © assets. Exclusive permission to use his Superyacht, by Paul. Tweaked orthos, courtesy USGS, for better immersion in XP environment. Feathered contours. Tropical waters. Thank you People by Altair.